Individual 2D lines, including those in 2D Line Sets, can be selected from the navigation bar of the 3D View and 2D Line View for display. Multiple 2D lines can also be selected in Map View for display in the 3D View, or selected directly from the displayed survey in the 3D View. Alternatively, an arbline can be created across multiple 2D lines to view the volume information in the Arbline View (see 2D Arbline Picking). Note: To view 2D lines from different surveys in 3D View, create a Group (see Creating a Group) and select the volumes from different surveys to display together in 3D View (you can select the 2D lines in Map View regardless of survey). In any 2D drop-down box (i.e. in the Map View and 2D Line View at Line), line sets will always be at the top of the list. This makes it easier to find and select important or relevant lines in a project with many 2D lines. Click on a line from the drop-down list to display in the view (see also Using the 2D Line View). 3D View window linking options are available from the Link section in the Display Settings (green spanner icon). Volume selection, IL/CL location etc. can be synchronised with other windows using this tool (see also Linked Multiple Views). Tip: To flip the horizontal axis, press Ctrl + R (see Hotkeys). In addition to selecting individual lines from the navigation bar, you can also select lines from the Map View to be displayed in 3D View. From the Control Panel, open the View menu and select Map View. Open 3D View and select a 2D volume at Vol. Click on the green spanner in the navigation bar and select Line selection under linking options. In the Map View, hold Shift and click on any 2D line in the survey. You can also select multiple lines by holding Ctrl (Cmd on Mac) and clicking on multiple lines. Selected lines will be highlighted in blue in Map View. To deselect a line, hold Ctrl (Cmd on Mac) and click on a selected line in Map View. To deselect all lines except for one, hold Shift and click on the line you wish to keep selected. Right click and select Show lines in 3D View. The highlighted lines will automatically be displayed in 3D View. 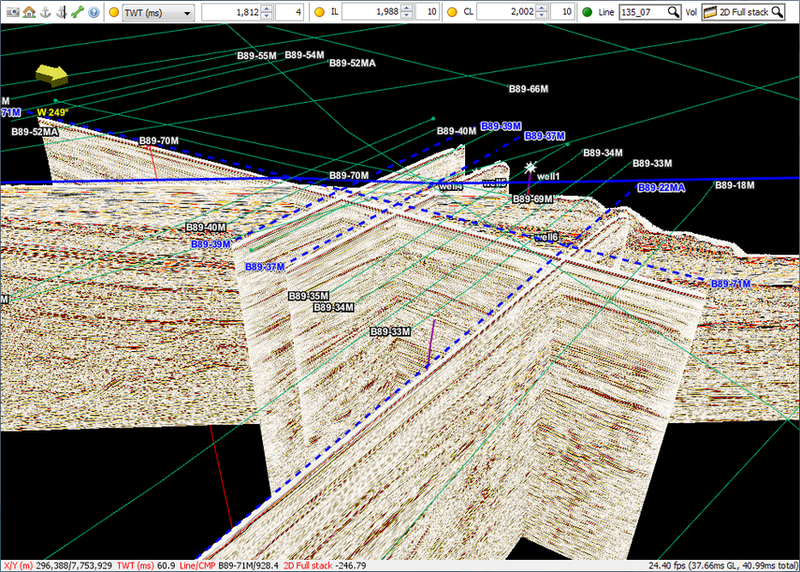 Multiple 2D lines can be selected via the survey displayed in the 3D View, speeding up the selection process. From the Control Panel, open the 3D View. Ensure that the 2D survey is turned on by selecting Show survey grid in the Display Settings (green spanner icon). Enable the Navigation bar and the toggle on Line option. Select the 2D volume in the navigation bar. Hold Shift and click on any 2D line to select a line. Select multiple lines by holding Ctrl and selecting multiple lines. To remove a line from the selected lines, hold Ctrl and select the line again. To deselect all lines except one, hold shift and click the line you wish to keep selected.